We all have a bit more time for reflection and adventure in the summer–and for Prep, a chance to extend our reach as a vital community resource. This week we had over 100 young boys and girls out on the soccer pitch with a terrific group of young British coaches from Challenger Soccer Camp. Forty teachers from across the country and from here in Santa Fe spent a week in deep inquiry in one of six EE Ford Summer Teacher Colloquia, directed by Prep teacher Drew Nucci and taught by six different Prep faculty. And twenty college and high school students are training this week as teachers for Breakthrough Santa Fe, which kicks off on June 23rd for its 11th consecutive summer. Wishing you some time for “indelible life patterns” this summer. 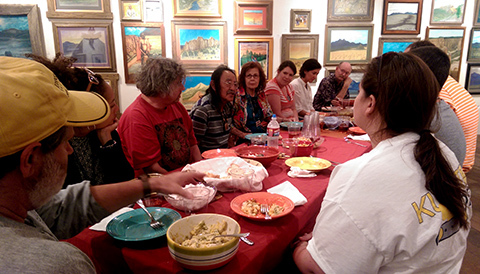 Above: Colloquium group, led by Prep’s Kristin Kalangis, feasting with Picuris Pueblo Governor Nailor at Than Povi Gallery in Pojoaque.